On the formal lawns beside Bonshaw Tower. The formal and woodland gardens are a beautiful and private surrounding for the couple and the wedding party to enjoy before and after the wedding ceremony. There are many stunning photo opportunities around the grounds. 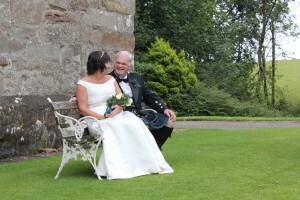 We welcome photographers to view the venue before the wedding day.